Adam Juhasz (21) became Muslim in 2008. 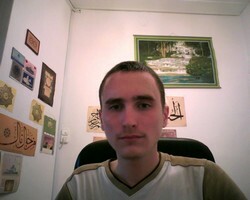 He lives in Budapest, Hungary and works with Turkish businessmen as an interpreter (Turkish, English, Hungarian). He told Lastprophet.info how he had become Muslim, as well as talking about what the main points of Islam were that influenced him in this process and the unique individual Prophet Muhammad (pbuh). First of all, what can you tell us about your early religious background? As far as I'm concerned, I don't think I can speak about any kind of religious upbringing, apart from the obvious ritual of baptism (when I was a baby, of course without my consent, as is usually done). My family, theoretically, is Roman Catholic, but practically atheists. Even for my grandparents, religion does not mean anything more than having some pictures of Jesus (pbuh) and Mary (pbuh) decorating their home; they consider themselves to be Christians without doing or knowing anything (or very little) about their religion. Even my grandparents (who are over 80) do not go to church (only very rarely) and when speaking to them you can easily understand that they are practically atheists (for example, they have no belief in the Hereafter, they take God's commandments lightly, they have no trust, hope or fear in God - or only when they are in serious trouble, they have very little solidarity with the poor, and regularly utter blasphemious expressions (like cursing God, etc. ), without even being aware of this. I would say yes. My family suffered while living together because of my parents' divorce, which took 4 to 5 years to finalize. Thus we participated in the constant struggles between mother and father. This resulted in a situation that even today there is hatred among family members, there is no love, no respect, no feeling of belonging together. Everyone tried to find a way to compensate for the suffering inflicted by this divorce (and the lack of love and sincerety in the home). For example, by becoming addicted to computer games, or developing futile and expensive hobbies, or trying hard to belong to a social subculture, as in the case of my sister and brother. How did your home situation affect you, particularly when you were young? I never participated in the parties, have never been drunk, and have never smoked, nor did I have a girlfriend or any of the other things that young people do these days. I simply separated myself from the world around me, devoting myself to studies (I was a very good student ) and computer programming and computer games. I simply had no friends and I did not communicate with my class-mates; I refused to meet with my father for years after the divorce and I did not communicate with the rest of my family (apart from physically living in the same house). I simply abandoned society when I realized - through my various attempts to utilize what this world offers us for the attainment of happiness - that it is all nothing but an illusion and a lie. And these sufferings influenced you when you were seeking the truth? Exactly. I started to look for the purpose of my life, as I always had a strong motivation to dedicate my entire being to a single objective. I was very interested in history, so I searched for ideologies and philosophies that were (seemingly) opposed to concepts of life that are associated with the world as we know it (globalization, liberal capitalism). I basically examined anything that appeared to offer an alternative and in which I suspected that there might be some aspect of the Truth. Although in word and action I denied God and was an atheist, because of the aforementioned reasons, that is, having absolutely incorrect information about God, I did not know what the Truth was. However, I felt that there must be an Exalted Being Who is above everything in the material world, above all the vain goals and concepts. I sought the Pure Truth that most people were following around me and, generally follow these days in the Western world (mostly, but not exclusively). But I had no idea what it was that I should feel, I had no way to speak about it to those who did not feel it (and none of the people around me felt it), since '[...]there is none comparable unto Him' (112:4). I studied Communism, Fascism, and a lot of other ideologies, but I found nothing that did not contain contradictions. The only things which were true in these ideologies (and which were true in all of them) were those elements that had not been invented by humans, like helping the poor, for example. As I said, I always made very good grades at school, but in the last year of secondary school, I decided not to do anything else before discovering what the goal of my life should be. I refused to follow the empty and unreasonable ways of the people around me who were doing things only because others were also doing them. I simply refused to go to thefinal 10 minute oral history exam and the Hungarian language/literature that were part of my school-leaving exam (which is required here not only for finishing secondary school, but also for attaining admission to university). This was the point at which I refused to compromise anymore, to pursue pointless things; I now refused to struggle for vain objectives anymore. I stayed at home alone for almost half a year, sleeping in the daytime, staying awake at night (because I hated to even see people; I was truly frustrated that no one around me cared to find out about or follow the Truth, that no one cared about why are they were living in this world, or about anything but their own desires...) and reading, thinking (sometimes taking walks at night; I liked that really). This continued until January, 2008, when I came to the point at which I said, if I cannot find my life's objective then it is pointless to live (as anyone with a little understanding would be able to realize, the suffering, struggle, etc of this world are much greater than the pleasures - that is, this life is not for enjoyment. I also decided that -no matter what- I would not stoop to the level of animals, with a life that is only about following and trying to satisfy various desires). I decided that I would commit suicide if I could not discover anything soon. Your struggles brought you to the threshold of suicide.. From this abyss, how did you come to embrace Islam? Is there any "one" incident that acted as the trigger? After this positive experience I searched for Muslims in Hungary on the internet; when I found them and went to see them, I looked at how they behaved, what kind of people they were, etc. I there almost every day for two weeks, then after a very positive experience I became Muslim. Since the Muslims I came to know were, above all else, sincere (sincerity was one of the things that I had been searching so hard for), they helped each other and me as well without any desire for worldly gain, only for the sake of Allah, for serving the Truth. Ashar, the Pakistani friend, even sent me some books about how to pray, the Qur'an and its English translation, from thousands of kilometres away, without ever having seen me or met me in person. This, while my father and mother were not even aware of what my problem was; they (and all my other relatives) were just attacking and accusing me for not finishing my exams. It was among Muslims that I found real brothers, it was in Islam that I found the way (the only way) to the Truth, and it was in Muhammad that I found the best example to follow, and it was in Allah that I found the One to submit myself to, the One, the Truth, the Pure and Exalted, nothing can be compared to Him; He is the One I felt in my heart out of His grace long before my conversion. Now, I've finally found Him, Alhamdulillah. What changed in your life after your conversion? In short, everything. First I followed the commandments of Allah as I wanted, but a few months I was graced with true, inner belief, and the inner experience of being a servant to Allah. Before that I was very arrogant and it was hard to even perform my first few prostrations; moreover, my relatives made fun of me when they saw that I was trying to prayer at home. It was really a hard time, but I told myself that if I refused Islam after having found it I'd be a liar, and my search would not have been sincere. So I prayed to Allah to help me and tried to do the best, memorizing the shorter suras from transliterations, praying 5 times a day and trying to do everything else as well. The great change was, when, as I already mentioned, I switched on to the grace of Allah. I came from the state of following the commandments of Islam through my willpower by pressuring myself to a state where I started to understand things by direct experience; now the shapes were filled with the contents. This point was very important, and made a lot of things much easier for me. To tell the truth, conversion to Islam is much much more than just obeying a new set of rules. Realising that we are the servants of Allah gives a totally different perspective to our perceptions and understanding of life, down to the smallest detail. The false image of cause-causation is broken to pieces; the Muslims realize that Allah is the only cause, He is the creator of everything and everything originates from Him and returns to Him. When we really start to believe in the Hereafter with our hearts and not only accept it with our minds then we can understand that this world and its pleasures are not worthy of following. And I can go on: when we start to realize things like 'there is no power and might but Allah', when we start to realize what the attributes/names of Allah mean, when we start to realize our role in this world, and so on, then Allah has opened an entirely new world up to us; this is something that is unimaginable for someone who is not blessed with Iman. I have tried to explain to my relatives hundreds and hundreds of times what my feelings and reasons behind my actions are, but so far there has been no success. How did people, such as your family, respond to your converting to Islam? Unfortunately, they did not understand me. They do not understand anything about me actually, due to the aforementioned reasons. They think that Islam is my new 'hobby', or a new period in my life, like a new way to rebel, as the youngsters do. They do not want anything but that which pertains to their desires like, a good job, money, a partner, nice house, cool car, etc. Even when they pretend to be interested in Islam, they are doing this with the motive to try to 'cure and help me'. Unfortunately, they do not have the understanding or the sincerity. As I said, they used to make fun of me and things pertaining to Islam; in fact, they sometimes still do. But this is not because of Islam; this is how they have always treated me, even before I embraced Islam. They are not religious; it is only when I ask them why they do not convert to Islam that they remember that they are Christians... Apart from my relatives, there are no people who are really close to me. I cut off contact with my former class-mates and other so-called 'friends', so I do not know their opinion, but I can imagine that it would not be very different from that of my relatives. Frankly, I was never knowledgeable about Christianity; what I knew was only from what I learned in school. As I could not find any sincerity there, I never really cared about it. Therefore, I cannot make a comparison, due to my lack of knowledge. What is the thing about our Prophet that is closest to your heart? What is the most appealing thing about him? Prophet Muhammad was someone who did not compromise the Truth, even though in the beginning he was alone against the unbelievers. He and his Companions also had a very hard time, but they did not abandon their struggle; they had extreme love and devotion for Allah and they loved each other only for the sake of Allah. Prophet Muhammad was one who had such a community, and this community loved Allah, His messenger and each other more than themselves. They were absolutely sincere, and with their submission to the Truth, Allah gave them greater honour and glory than all those who tried to achieve the same with arrogance and pride. Prophet Muhammad cared for the poor more than anyone else, giving away even his last shirt, or not eating for days because of having distributed his food. He cared so much about his community (even those who would come after him), that amongst his last words he uttered: 'ummatee, ummatee (my community, my community)'. He was grieved when he learnt about the torment of hell, and that he would not be able to save everyone. There is no person in history who is comparable to Muhammad Mustafa, in any respect; the blessed effect of his teachings can be clearly seen in his blessed Companions as well. One could go on in this way for thousands of pages, yet not finish describing the blessed character of Prophet Muhammad, which is the best example for us to follow. How is Prophet Muhammad perceived and received in the part of the world you live in? In Hungary, as I've already mentioned, there is, in general, huge ignorance about Islam. Basically, the only source for the vast majority of the population about Islam and Prophet Muhammad , is the lies and misconceptions of the Orientalists. For instance, many people consider Islam to be the religion of Muhammad; they think that wrote the Qur'an. Even in one of the two full Hungarian translations of the Holy Qur'an, in the comments it is written that Muhammad took this passage from such and such a book, as if he was editing the Qur'an with some other sources - of course, this translation was made by an Orientalist. At the same time, people are ignorant about Islam, although they are in general not opposed to it; rather, most of them, at least, are just not aware of it. Here in Hungary as well, Alhamdulillah, the Muslim community is steadily growing; more and more people, Hungarians and others, are converting to Islam. And thanks to the efforts of a few very devoted Muslim brothers and sisters, the correct picture and the correct information about Islam are being delivered and about our beloved Messenger is getting through to more and more people. How is the Mawlid of Prophet Muhammad celebrated in the part of the world where you live? Here, there are a variety of Muslim groups, a variety of mosques that have more or less different approaches to Islam. Therefore I can't give a general answer, since some parts of the Muslim community in Hungary celebrate the Mawlid of Prophet Muhammad, and others don't. Also, these things are more difficult to notice than, for example, in Turkey (Which I visited about half a year ago). For example, I've been told that in Ramadan there is a a completely different feeling in countries that have a large Muslim population, while here you can't notice it, unless you go to the mosque. I have only been Muslim for about 1.5 years (and of that time I have spent about half a year in Turkey), so I don't have a great deal of experience with which to answer this question. In Turkish culture, the "rose" is a frequently used symbol for Prophet Muhammad. Have you ever heard of this? Do you have such a symbol for Prophet Muhammad in your culture? Yes, I've read some books by Turkish authors about Islam about Prophet Muhammad, and I have met this symbol. While I'm aware of this frequently applied metaphor, I don't know much about it. As for our culture and the symbol of rose for our beloved Prophet, in Hungary (although Islam has very deep roots and a long presence in the history of Hungary), there is no such thing yet as 'Hungarian Islamic culture', or more precisely, Hungarian culture generally does not include Islam, because of the various problems with Islam in Hungary. If you ask a Hungarian about Islam in Hungary, he will not even be aware that our ancestors were Muslim tribes when they arrived in our present location, the Carpathian Basin. Of course almost every Hungarian is aware of the Ottoman presence for around 150 years, but mainly due to the Habsburgs, whose presence is still felt even till this day; therefore, the Ottomans and Islam are considered to be alien. Muslims in Hungary work hard to shed light on the fact that we (although we are not aware of it) have closer ties to Islam than we think. However, the popular culture of Hungary is basically Christian, despite the long presence of Islam in some way or another in the country. For this reason, I cannot speak of any symbol for Prophet Muhammad in Hungarian culture. What do you think about our website? What should be added to draw the attention of more people from all over the world? I liked the design and the content of the website; I saw that you added recitations of the Qur'an. This is a good idea. I think in the future that it would be great to add a version of the Holy Qur'an in Arabic with its translation into various languages, along with some recitations, and some tafsir as well, or just a link to another site with these functions. Maybe something similar could be done for Hadith as well, adding an interactive Qur'an or Hadith explorer function, thus allowing the exploration of not only the Holy Qur'an, but also the main Hadith collections as well. I hope this website will fulfill the expectations and serve its cause well, and I hope that Allah will reward those who have contributed to this effort. Please type '528' into this field.